Old English brycg (noun), of Germanic origin; related to Dutch brug and German Brücke . 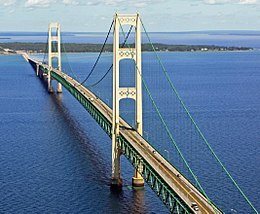 The Mackinac Bridge (pronounced Mackinaw) connects the Upper Peninsula of Michigan to the lower, much larger part of the state. There is no geographic tie. In fact, the UP actually extends from Wisconsin. I have no idea how it became a part of Michigan. The bridge spans Lake Michigan and Lake Huron, which meet right under the bridge. It’s a beautiful sight, both as you approach it and as you cross it. The lakes are so big that you almost feel you’re crossing an ocean. Even if it’s hot outside, the air cools noticeably as you cross the water and arrive on the UP. Once we crossed, we’d usually find a good place to park along the shore of Lake Michigan and let the kids run off some energy. They loved it up there, and so, of course, did Terry. As a special treat, we’d find some smoked whitefish and fresh pasties, both so delicious they’d melt in your mouth. (By the way, it’s pronounced like “past,” not “paste.” Just so you know.) Then, pack everyone up and head across almost to Wisconsin, and a joyful reunion with the grandparents. Terry still misses the UP. Me? Not so much. We lived up there for a couple of years. Biggest mosquitos in the world, deer flies who aren’t particular about whether or not you’re a deer. Two seasons: Winter and a few minutes in July. One year, it snowed on my daffodils. In MAY! Ugh. So there you have it. That’s the first thing I thought of for today’s prompt. One time we drove through from Manitoba to Ontario, three of us taking turns at the wheel. My turn started about 11pm and I prayed all the way that I wouldn’t hit a deer. Thankfully, for the dozens of deer I saw on or beside the highway that night, I never hit one. If you’re talking about US 2, which we always took, yes, it was pretty wild and woolly:) You made sure you gassed up just as you left the bridge, because you might not find an open station anywhere else. That’s what Terry loves about it up there. Not many people, lots of trees, lots of deer. How are you doing? How’s the new job? PM me if you want. I am doing very well! The new job has been going great, and I’m starting to see the paychecks roll in. It feels good. That’s good, Kyle. I’m glad it’s working out for you. Since the UP is God’s Country, it is crystal-clear with whom you need to get your heart right. I never wanted to move away from there, but I understand why we did. It was a very difficult decision, Mike. Taking you two boys out of your grandparents’ arms and pulling out of that driveway? Well, the tears rolled for me for at least an hour. Your dad was up ahead in the U-Haul, but I’m sure it was hard for him as well. And now, with six of my own grands so far away, I understand even more clearly how it felt for your dad’s parents to wave goodbye to us that day.